While they were here, they did some housecleaning in our breaker box as well (two breakers to nowhere, whaaat?). And while they were finishing up, we chatted about how we could remove our tiny little deck out back and replace it with a patio. As usual, they were courteous and professional and answered all my questions. Two thumbs up to Lee Company! 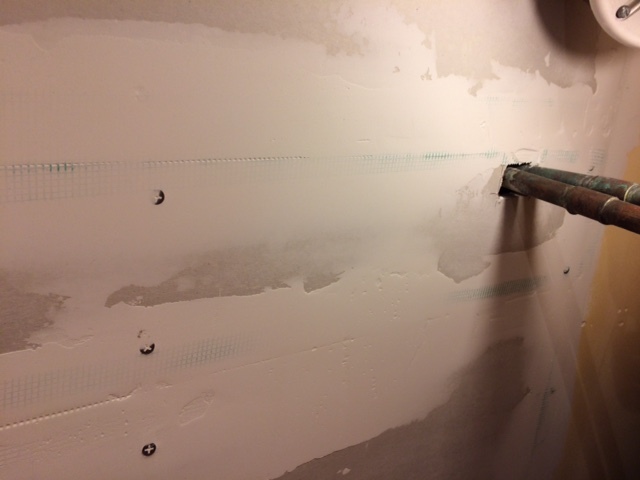 While they were outside, running PVC conduit and drilling holes in the house, I decided to do some work of my own and sand down the first coat of spackling in the closet. Since it was applied particularly thickly with my usual lack of spackling finesse, it took me about three hours to sand it down to my satisfaction. The first sanding doesn’t have to be perfect, since a second coat will be applied, but I tried to smooth it as much as possible. 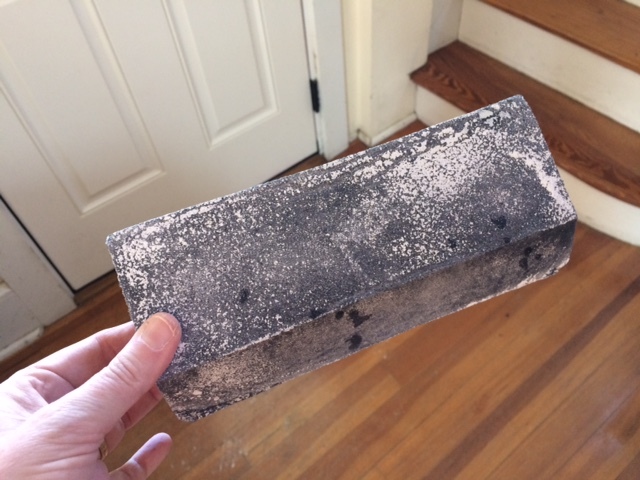 For drywall sanding, I like to use a sanding sponge. This one has a 45-degree angle on one edge which really helps getting into the corners. As you can see, some areas look pretty good after one coat. 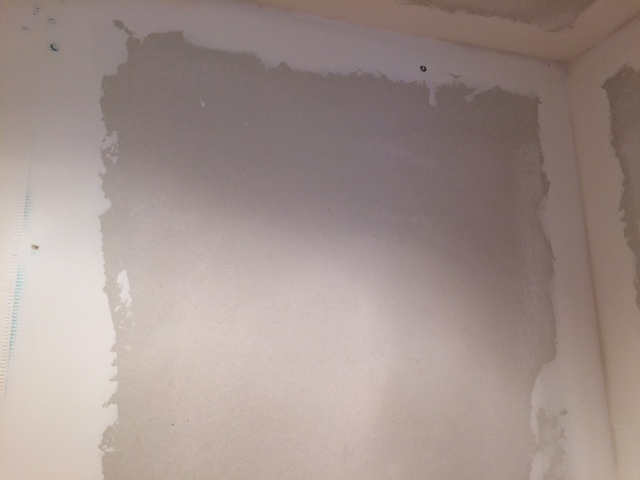 Look how I was able to fill and seal that giant gap between the back wall and the ceiling. 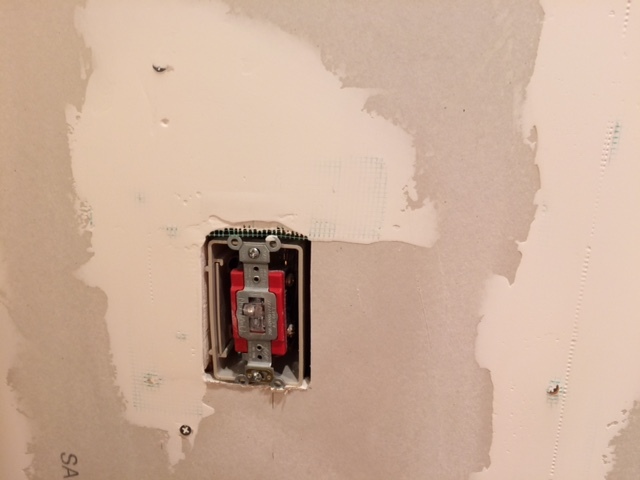 However, there is still some fiberglass seam tape and a few drywall screws showing through in places. These will be fully covered by the second coat, which I am hoping to apply some time later today. That way, I can let the second coat dry for a full 24 hours before the final sanding. It’s getting so close to being done!